Mahatma Gandhi was the greatest War General ever who revolutionized the war from conception to culmination. Generally we associate Generals with wars in which soldiers or terrorists use deadliest weapons to kill their adversaries, on a large scale of lakhs in order to win territories or commerce etc and impose their ‘will’ on the adversaries! Gandhi did nothing of the sort, so how can he be called a war General? But I have called him a revolutionary General. There are many definitions. War is a conflict involving the use of weapons and physical force between nations, or other large-scale armed groups. F.W. Robertson, a military expert, defines war as, “A contest between nations or states, carried on by force, whether for defense, for revenging insults and redressing wrongs, for the extension of commerce, for the acquisition of territory, for obtaining and establishing the superiority and dominion of one over the other, or for any other purpose; armed conflict of sovereign powers; declared and open hostilities.” The most quoted definition of war, as given by the famous German General Clausewitz is, “War is an act of violence to compel our opponent to fulfill our will.” This definition is simple, and powerful as the word ‘will’ encompasses all the aims of war. Gandhi fought a total war against the colonial British Empire, indeed the most powerful empire at that time. He compelled the British to fulfill his will of giving India full freedom. We may, though, say that he won only partly as he never wanted the India to be divided. However this does not reduce the importance of his victory as the British had cleverly managed to play the card of hatred between communities. We know hatred is always easy to spread than love, and a part of Muslim community fell prey to the British chicanery. The wonder of wonders is that despite the well known British trick of ‘divide and rule’, and their strong desire not to leave the mine of gold that was India, Gandhi’s movement of love, truth and ahimsa defeated the most powerful empire. What is most important is that in the history of war and ethics it would be written that Gandhi revolutionized the definition of war, by putting it, so to say, on its head. In my view he would have defined it as ‘War (our) is an act of NONVIOLENCE to compel the opponent to fulfill our JUST will.’ War by definition and praxis has always been associated with blood and gore. It was Mahatma Gandhi who for the first time in the human history distinguished war from mere bloodshed. It should be emphasized here that despite the brutal use of violence and bloodshed by the opponent, Gandhi never used, nor did he permit the use of, bloodshed or violence. Indeed this principle of non-violence or ‘Ahimsaa’ for Gandhi encompassed not only action and words but even thoughts, which is an even more difficult human endeavor. Generally war is considered opposite of peace. And it is usually defined as the absence of war. Gandhi ordained, ‘don’t hate the sinner, but the sin’; and thus extended the meaning of the word ‘peace’ from mere passive to an active domain including all the three domains, viz. thought, speech and action. We will understand better as to why peace remains a victim of a war long after it is over by what Clausewitz has to say on the subject ; “War’s political object properly lies out of its province, for if war is an act of violence to compel the enemy to fulfill our will, then in every case all depends on our overthrowing the enemy, that is, disarming him etc. (at another place he clarifies that ultimate aim in a war is destruction of even the will of the enemy) ” It is here again one realizes the importance of Gandhi’s dictum : ‘hate the sin and not the sinner’. What were main weapons of Gandhi that he used against the mighty empire? Surprisingly, they were ‘truth, ahimsaa and love’. These are, again, revolutionarily different from the age old standard and norms of the world. These are human values which inevitably are the first ones to be sacrificed at the altar of war. He also used the respect for law of the British as a strategic weapon against them. This is important because the power of love, truth and ahimsaa would be difficult to wield on barbarians like e.g. Genghis Khan or Hitler. Willing sacrifice, fortitude and peace of mind were Gandhi’s some of the other weapons. Hindustani was also a weapon for him. Before him the language mostly used in Congress was English. It was Gandhi who realized the use of Hindustani or Hindi as not only a unifying element but also a ‘nationalizing’ and ‘acculturizing’ element. With the use of English it would have been, on the one hand, more difficult to invoke and inculcate Indian values among the English educated; and on the other hand, the great masses would not feel involved, who were the real back bone of his army. Thinkers, such as Heinrich von Treitschke eulogized wars as those human activities where courage, honor, and determination are more necessary than in any other endeavor and therefore are the most adorable, glorious and worthy of emulation. This adoration of war has been practiced by many from Sparta in Ancient Greece to Alexander to Mongols to Arabic leaders, to Napoleon, to Hitler and so on. It is against this backdrop that one has to view the revolutionary concept of war and peace proposed and practiced by Gandhi. One can counter my thesis about Gandhi by stating that Gandhi’s was a political movement and therefore not a war. General Clausewitz states that war is basically a political act because it always starts from a political condition and motive of nations. General Clausewitz further asserts that war is not merely a political act, but also a real political instrument, a continuation of political commerce, a carrying out of the same by other means. This phrase ‘carrying out of the same by other means’ is very meaningful. It implies those means that are other than peaceful means like diplomacy or negotiations etc. The world has always thought ‘other means’ to be deadly violent. It is Gandhi who has given a new meaning to the above phrase. Gandhi’s war is for just purposes and is to be fought through only nonviolence, truth and without hatred. I am going to demonstrate the Generalship of Gandhi by analyzing his actions and comparing them with the principles of war. Principles of war have been developed through millennia. Principles of war are those vital areas of activities during a war which must be paid due attention if the war is to be won. It may be said that the side that wins the war is one which is able to follow the principles more than its adversary. There are many principles of war enunciated by many experts. The most important principles are : aim of the war, strategy, offensive, surprise, force-concentration, economy of force, unity of command, intelligence, flexibility or mobility, technology and logistics, and morale; and these are not listed here in any order of preference. The order depends upon situations etc. One of the reasons for defeat of mighty Hitler was his wavering aim. Gandhi’s aim was clear and unwavering – independence by use of truth, ahimsaa and love. It was his personality and success of his non-violent movement in South Africa against a more brutal Government that gave a unique charisma and power to his words and actions. People of India had developed a steadfast faith in him. Indians believed in the success of even in this impossible sounding ‘non-violent’ movement for freedom against the most powerful Empire in the world. Another value that Gandhi had added to his fight was the principle, though it is only an extension of ‘truth’, that ‘ends do not justify the means’. It has always been believed by most that ‘all is fair in love and war.’ Gandhi e.g. called a halt to his successfully progressing movement in 1922 throughout India when he found that in Chauri Chauraa his ‘volunteers, had used violence. Gandhi did it despite the advice of most of his deputy Generals that he could apologize for the violence, and continue the movement which was started under extremely difficult conditions. This demonstrates that in truth to him means were more important than the end. This may appear to be wavering from the specified aim of the war, but Gandhi realized that such a concession would weaken his and therefore India’s position both in the outer and inner world. Gandhi would have neither read Clausewitz not heard about it, but his own understanding of the subject is not only close to his, but it goes well above it. Gandhi was no General appointed by any Government and had no resources that an army has. Not only Gandhi’s aim was clear and steadfast, his handling of whole issue demonstrates that he understood the phenomenon of ‘war’ more than any General does. In a very simplified way it can be said that ‘strategy’ deals with long term goals of a war; and tactics with short term goals. Gandhi’s strategy was difficult to understand not only by the British Generals including the Viceroy, but by many Indians. One’s strategy must be kept a secret from the adversary otherwise the adversary could pre-empt the action. Let us take the example of ‘Dandi March’, the ‘Salt Movement’ of 1930. Gandhi did not keep its purpose a secret; on the contrary he had informed the Viceroy in writing about it well in advance. In 1930 the Congress had declared ‘Poorna Swaraaj’ as its goal, and was thinking of suitable actions. Dandi March was the brilliant stroke of Gandhi in response to that. Production and sale of salt in India was totally under the British control, and they had imposed a tax on it. Gandhi wrote to Lord Irwin, the Viceroy, “…. 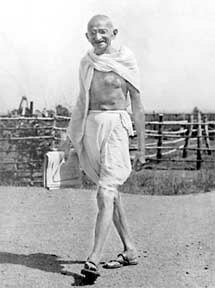 If the British were not prepared to combat the various evils afflicting India under colonial rule, Gandhi was prepared to commence a fresh campaign of ‘civil disobedience’….He intended to break the salt laws….” The British and the whole world laughed at the threat and the Viceroy warned Gandhi that all his followers would be jailed for breaking the law, and he better abide by the law. Well the rest of the story is well known to be related here. To charge the people with enthusiasm, sacrifice and the indomitable will and confidence in securing victory through non-violence. All this was to be achieved by simply marching some 400 kms. from March 12 to April 5 of 1930. This Movement appeared rather simplistic if not childish to the British. They could not grasp the strategy behind the ‘Salt Movement’. Gandhi on the other hand was aware of the difficulties, hardships, and suffering that was to come. He, as a part of tactics, therefore refused many many willing women volunteers for taking part in the March. Purpose of this refusal was also to not give an excuse to the British for not being severe enough in their physical torture in the name of punishment against breaking of the law. He wanted everyone in the world to see the cruelty that the British would impose on the non-violent marchers. Adversities would strengthen the resolve among Indians, and also create a favorable opinion in the world for his movement. It was to act as a spark which would ignite the flame of fight for freedom amongst the large population of India. The Dandi March delivered a heavy blow to the British. Surprise catches the adversary unprepared and therefore increases the chances of victory. In brief, it may be stated that Gandhi used this in surprising ways, e.g. Dandi March though declared, was a total surprise to the British as far as consequences are concerned. His support to the British in the WWII was a surprise to many including the British, which however created a favorable opinion about his movement all over the non fascist world. A purely defensive side in a war can at best avoid a defeat, can never achieve victory. He was ever offensive in his war, e.g. the fight for the ‘Indigo workers’ in Champaaran district, Dandi March etc. Let us say if a target like an airfield requires 20 bombing sorties to be destroyed. If the 20 sorties are carried out, in one example, in 4 days; and only in one day in another example, then obviously the second example would certainly achieve the better result. In the first case the enemy would carry on repairing the damage as it would be of smaller magnitude, and time and resources available locally may also be used. Gandhi gained ten or twenty times the impact by using the 400 kms of Dandi March, then he would have gained if he had kept the total distance to say 100 kms. War is one of the most expensive activities of mankind. No nation has unlimited resources even for a war of survival, therefore economy is always valuable in war, which means use of appropriate amount of resources. This is where the judgment of a General is vitally important. Gandhi started his Dandi March with only 76 volunteers. At the end of the 400 kms march he had a few thousands of them. There must be only one Commander for one battle, and one Commander-in-Chief for the war. A command given for any battle must be followed exactly as given without any deliberate or inadvertent dilution or distortion to achieve success under trying circumstances. Gandhi created this first by proper training of his lieutenants. And second, by giving long periods between his orders and their execution, which permitted exchange of ideas, and thirdly, by keeping actions simple. During a war both sides hide their correct information and spread disinformation. Therefore ‘intelligence’ is necessary to know the other’s motives, order of battle and movements etc., to enable one to be prepared for own defense and achieve a surprise and effectiveness in one’s attack. Gandhi had understood the behavior of the British too well to be surprised by them; and yet he could surprise them. It must be admitted that he was surprised, if not defeated, by their ability to divide India. This reduced the magnitude of his success. In a war there are many battles to be fought, which battle would become more important than the rest is not easily known. Therefore flexibility is important which enables one to move forces to the appropriate theatre in proper time. Means of mobility are therefore important. Gandhi had his lieutenants and his force ready all over India who were ready to ‘March’ at a short notice. The advancement of technology has made it dominantly important as has been demonstrated during the Gulf War of 1991. Technology permitted the US and its allies to win a war against mighty Iraq in a surprisingly short period. Truly this war can be called ‘The High Tech war of Twentieth Century’. Electronic warfare and technology superiority helps to provide air superiority which in turn leads to victory. Gandhi used successfully the important technology of media in his war, to a surprising degree. Logistics is the ability to provide necessary resources at the place and the time required. Further, he kept the requirements physically simple (though mentally tough) in his war of non cooperation. He didn’t need any weapons of destruction. He put the British Empire to shame when they used inhumanly heavy armor against the peaceful gathering of Indians in Jalianwaalaa Baag. Morale is the sustained will power to fight the adversary to win the war, regardless of the consequences. Morale is applicable to both the soldiers and the population. This depends on many factors like, strength, the nobility of aim, faith in the leader etc. Gandhi’s personality it self was the greatest morale booster. He said, “ My life is my message”. Gandhi was the personification of truth, love and ahimsaa, and also of selfless service. He had demonstrated that he could win under even worse conditions. People had full faith in him, and therefore their morale remained high. As an example of the morale Dandi March is again a good example - people swept and watered the roads where the volunteers were to march, and showered the marchers with flower petals, apart from feeding and accommodating them. It has been demonstrated that Gandhi changed the definition and execution of war fundamentally, and he brought values like love, truth and ahimsaa in war. It must be admitted that Gandhi’s concept of war can be useful for liberation of a country from a foreign power, but not in fighting an enemy’s attack on one’s nation. In the later case he himself supported the conventional wisdom. His concept can be used in meeting just demands of a people in their own independent country if the rulers fail in their duty. This has been used in South Africa by Nelson Mandela, in USA by Martin Luther King for securing equal treatment for blacks as well as in other countries. It appears that Gandhi has become ineffective in India itself! Does it mean Gandhi has become irrelevant? No! War is as old as human history, and probably would carry on till eternity, or till a war destroys the world. War is part of our nature because resources would always be limited and man would fight for them. The aim ought to be to convert the definition of war from the old one to the revolutionary meaning that Gandhi has not only given but has demonstrated its practicality and humaneness. The ultimate aim of the human evolution is to become ‘human’ instead of a well dressed and well armed biped animal. And so long as that is the aim, Gandhi would remain relevant.